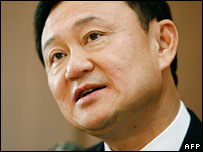 Former Thai Prime Minister Thaksin Shinawatra has said he has completed the takeover of Manchester City. Mr Thaksin lodged an £81.6m takeover bid for City in June through his company UK Sports Investments and has steadily built up his shareholding. His spokesman said that he now owned 74.03%, close to the 75% needed to take the club off the stock market, but that the deal was unconditional. Sven-Goran Eriksson was named manager of the Premier League club on Friday. Former England coach Mr Eriksson has signed a three-year contract and succeeds Stuart Pearce. The Eastlands board has backed the bid but there have been concerns about the source of the money, with Mr Thaksin facing corruption charges in Thailand. But the man who brokered the City deal has said "the money is clean". On Sunday, Keith Harris, executive chairman of Seymour Pierce Investment Bank, said the money had been "legitimately and transparently transferred to the UK". Mr Thaksin will have to pass the Premier League's standard "fit and proper person" test before being able to complete the proposed takeover. Thai prosecutors recently filed corruption charges against Mr Thaksin. They have also frozen his assets but Mr Thaksin insisted this would have no effect on his takeover of the club and that the charges were politically motivated by the military installed government that replaced him. Leading shareholders including current board members, former chairman Francis Lee and BSkyB have all agreed to sell their shares to Mr Thaksin.